Don't let his facial hair get too bushy. Toy poodles might be small but they are hardly low-maintenance pets. Like their larger cousins, they need regular clips and a thorough grooming routine. 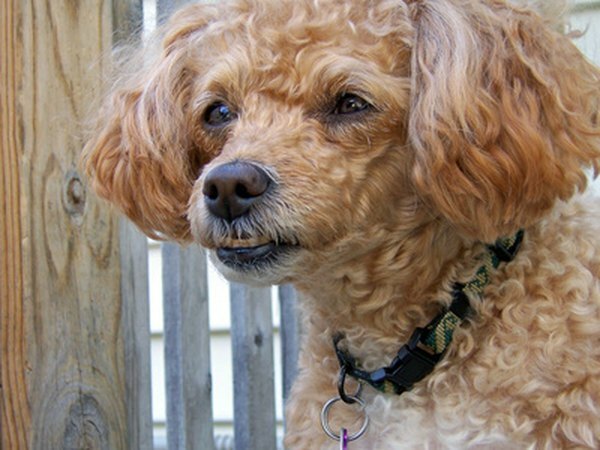 Dirt and discharges on the face don’t just look grubby, they can lead to infections -- so keep your toy poodle's face tidy. Fill a large bowl with warm, not hot, water and place it beside you. Ask your poodle to sit. If you have trouble sitting, crouching or bending to the level of a toy poodle, lift him onto the sofa or another piece of furniture first. Brush through the hair around his face and on his ears. Brush carefully in a downwards direction. A comb might be easier for some parts. Dip a facecloth or other clean cloth into the warm water and wring it out. Cup his jaw and wipe his face, again in a downward direction, making sure to remove any crusts or bits of food from around his mouth. Dampen a cotton ball and dab it around the eyes to remove matter or tear stains. Repeat as necessary with fresh balls. Dampen another cotton ball and lift his earflap. Clean the accessible crevices of the outer ear. Do not push the cotton ball into the ear canal. Repeat with a fresh cotton ball for the other ear. Ask your vet or dog groomer to show you how to clean ears so you can see the process demonstrated correctly. The same applies to tooth brushing and nail trimming. You can do these at home later but without an in-person demonstration first, you run the risk of hurting your dog. 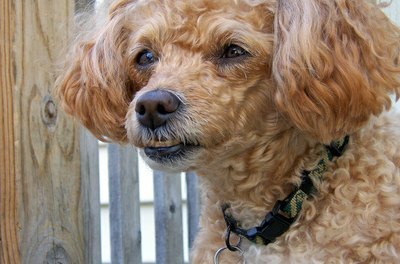 A poodle’s hair should not be obscuring his eyes -- if it is, it is time to take him for a haircut. If your poodle objects to his face being touched, take it slowly. Touch his face when you are petting him and reward him with treats and/or more petting where he likes being stroked. Dogs are responsive to tone of voice so don’t forget to encourage him vocally as well. Once he is comfortable with you touching his face, you can include face cleaning in the regular grooming routine. Some tear stains are normal in poodles, but if you notice a steady discharge, redness, swelling or an unpleasant odor around or in his ears or eyes, book an appointment with your vet. If mats have developed in the hair around his face or anywhere else, ask your vet or a dog groomer to remove them. It is difficult to remove them yourself without hurting him, especially on the face.